Home buyers now use the internet as a primary source when browsing for properties. By doing so, they are easily able to check for new instructions several times a day to spot advantageous opportunities. A modern, high street estate agent is, therefore, no longer reliant on the shop front. To achieve the best marketing, properties marked 'For Sale' must now be prominently displayed on the internet through their own website and through 'portals' displaying a collection of agency's wares. Initially, few web entrepreneurs presented various offerings to buyers looking for an online 1-stop shop. The first portal of note was Rightmove, giving their member agents an excellent way to display their houses for sale to the online public. Others soon appeared such as FindaProperty.com, Fish4Homes and Zoopla - many formed by the hurried purchase and amalgamation of smaller portals. Additionally, innovations offered by these portals are suspect, often bypassing the experience and skills of their member agents by offering spurious, automated property valuations and poorly constructed marketing efforts in the pursuit of enhancing shareholder value. It is now a regular occurrence for a homeowners' expectation of their property's value to be completely incorrect due to a few clicks on a portals valuation page. Competition between portals has gradually grown to the current level where there are only a small number of large companies offering buyers a single outlet to search for properties. Now, buyers have to access several of these portals to search the entire market. Recently, concern amongst estate agents highlight that the leading portals are becoming too large, and, consequently, are delivering a service which distorted the market to buyers. Additionally, these portals were able to restrict marketing options to agents whilst continually increasing their subscription charges and offering very little in compensation. Objectives in serving the house-selling public has now moved from personal, independent customer service, to enhancing shareholder value by increasing revenue, increasing intrusive advertising and increasing profits. A new portal has therefore been formed. In January 2015, the OnTheMarket.com property portal was launched in the UK with a focus of delivering the strong agency service that high-street estate agents strive for on the online arena. It is unique, in that the ownership is by its agency members, with an aim to not increase profit, but to enhance the online house-buying process for sellers and buyers alike. OnTheMarket.com is dedicated to providing the best service for estate agents, their clients vendors and landlords and UK home seekers. Member agents can now insist on the best presentation and marketing of their properties. When your home is on the market you want the best price you can get - and so do we. You also both want your property to look its best. Thousands of agents have moved all their properties from other sites to OnTheMarket.com. Seven days a week we show prospective purchasers around properties. This has been our preferred method of selling as we find at the early stage of interest it is best to keep our clients, the vendors, and the potential buyer apart. We wish to keep the general niceties out of the dialogue -“would you like a cup of tea” - and let the prospects have a really good look. Remember this will probably be one of the biggest decisions of their lives. Within 24 hours of the viewing we will contact the prospects and ask them if they are interested. This is very important as we can then relay the FEEDBACK to our clients. We do this immediately advising them word for word of the views. Well my view is that it is far better to purchase a property at the right price that requires doing up, modernising or whatever word is used. Why pay for someone else's ten year old kitchen and appliances, fifteen year old bathroom and shower and decorations that you do not like etc. How much nicer it will be for your new property to have a brand new kitchen and bathroom of your own choice and your own decorations etc. I read in The Times on Tuesday 8 March 2016 that by 2025 house hunters will be able to use drones to scrutinise neighbourhoods and will visit properties remotely through virtual reality devices, a report on the future of the property market claims. I have my doubts about this report - but actually it already happens in many ways. I started selling houses in the 1960s. At that time we advertised houses for sale. People viewed and made offers. People arranged their finances, mainly with Building Societies and if everything tied in the deal was placed in solicitor's hand which then took quite some time. So, where have things changed? Some 50-odd years have passed and the answer is, very little. The only real change happened with the advent of the internet which of course has altered practically everything in the world. Before the internet the prospective purchaser had very little knowledge of the area, the street or the property. Now prospective buyers can find information on sales prices for the last ten years on the street and nearby streets they are looking at. They often will know how much the property they are interested in last sold for. This knowledge had changed everything and quite rightly the prospective buyer can really research the property of their dreams. Before the internet a prospective buyer would have to be trailing the estates agents in the area they are looking at daily. They would need to be daily checking on boards and eagerly awaiting the weekly property supplement in their local paper. Today the internet is instant. Properties are show off to the world the second they are marketed. So yes, there have been changes but these are all down to the internet and as for drones - well I don't think so! We already have Google where prospective purchasers can look at properties as though they had a helicopter so we really already have drones. The future may not see so many changes. The legal system, which has not changed in all my years, could. Remember this is practically the only country where sales are made "subject to contract". In other countries the only way to buy a property is to sign the contract. A good estate agent is still required to advise and assist people with their purchase and at Alan Cooke Estate Agents we have been doing this for a very long time. The first two months of 2016 have been very busy here at Alan Cooke Estate Agents. Sales have been brisk especially houses up to £250,000. At the same time more expensive properties have found purchasers if the vendors have been prepared to accept realistic offers. There is a definite shortage of properties available on the market. This in itself increases the chances of a quick sale as prospective purchasers are often in a competitive bidding situation to tie down the property of thier dreams. All in all we would say this is a very good time indeed to market your property. You can expect instand action, viewings and hopefully offers. Telephone us today on 0113 2888 666 to arrange a valuation and market appriasal without any obligation whatsoever. From April 2016 a higher rate of stamp duty land tax (STDLT) will apply to purchases of additional residential properties including buy to let properties and second homes of THREE PERCENT ABOVE CURRENT RATES. This tax reaches far wider and may be more damaging than first anticipated. The measures will impact not only on properties traditionally thought of as “second homes” but will apply to parents who purchase property for their children's occupation or otherwise takes an interest, however small, in a property that their child owns. The specific rules are still being discussed and may be subject to changes before the regime is implemented. Under the current proposals where there is an “overlap” period of ownership a surcharge must be paid and then reclaimed within 18 months. This means that any move must be planned correctly or you are going to find a number of financial surprises. Plans to apply a new higher rate of SDLT to homes bought by companies which will impose a surcharge on first residential property bought by a company preventing the use of such structures for tax avoidance, closes another loophole for property owners. If you are already living abroad and have a place in the UK you are not safe either. Rules on split year occupation set to be introduced will mean UK citizens who have chosen to purchase a property in the sun would be subject to the surcharge and not eligible for a refund. The consultation document proposes a number of revelations. For the purpose of UK SDLT the number of residential properties that you own will be counted on a worldwide basis rather than just the UK. Many of these proposals are likely to stay. It is therefore cricual that anyone owning a second home in the UK must consider seeking advice from a specialised UK property advisor. With the run up to Christmas we can look back and acknowledge that 2015 has been a very good year for the property market. Sales have been made at record prices, often rapidly, and so therefore stock levels of for sale properties have remained low. We would expect that from January onwards we are going to be very busy, so now is the time for you to be gearing up to market your property with every confidence that you will get action. We have been active as estate agents in North Leeds since 1964 - over 50 years! - working 7 days a week for our clients to ensure that good sales are achieved at the best prices. If you are considering moving this is a very good time. We would be delighted to help; our fees are always competitive. We would be delighted to see you and have a chat. Here at Alan Cooke Estate Agents we endeavour to present our properties in the very best light. We have invested in the best cameras and lenses so that our photographs are always the best. Compare our photos with other agents and you will agree. A recent article in The Telegraph by picture tsar Andy Donaldson gives you some very very bad examples which I am sure are not from Leeds. As 2015 draws to a close we can definitely say that this year has generally been a good year for the property market. Interest rates have remained at record very low figures and although they could eventually increase we would expect that to be only a quarter of a percent or so. Stamp duty for all properties under £1,000,000 has actually decreased and the silly bands have now been dropped. The election has been and gone and we should now have at least some four to five years of stability. Investment in residential property still outstrips any other category over time - there can never be a better time to increase your investment in a new home. Your money appreciates tax-free over time and besides providing a sanctuary for the family it could be a nice little “nest-egg” for the future. There is nothing that we can anticipate on the horizon now which should worry a home owner or investor. We therefore feel that now and the coming year is as good a time as possible to market your property. With over 50 years of experience in the North Leeds market, we at Alan Cooke Estate Agents have worked with credit squeezes, mortgage famines, very high interest rates and general apathy. Today we can foresee no problems. Alan Cooke Estate Agents is a family run business with a long proud 50 year old history. So if you have not called us before for a valuation, without any commitment whatsoever, may we now invite you to do so. Or better still pop into our Harrogate Road office at Moortown corner and let us acquaint you with what is going on in the market, past, present and future. Either way we would like to see you, have a chat, perhaps over a coffee. Currently we have a shortage of properties on the market. This has meant that as soon as properties between £180,000 and as high as £500,000 some onto the market, there is a hive of activity. In most cases high volumes of viewings take place which lead to multiple offers and therfore sales. There is no doubt that this is a very good time indeed to market your property. History tells us that markets change and indeed will again. Do not leave it till later when the market could be flooded with properties which will then become a buyers market. 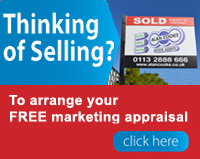 Call or email us today to arrange your fee, no obligation market appraisal. Making your property as appealing as possible to potential buyers is the challenge facing anyone selling their home. Use our quick guide to focus on what buyers will see, hear, feel, smell and taste to make your house more saleable. The look of the house is the first thing a buyer will judge. So make sure the house is presentable. Here are some obvious and not-so obvious tips to help sell your house. Clean and tidy. Walk into any shop on the high street and you will see goods on display that are fresh, clean and presentable. Why not show your house in the same light. De-clutter. House buyers want to see open living spaces and walls so that they can find inspiration to fit into their lifestyles. Make sure your rooms have as little clutter as possible. Try to find storage for excess items, children's toys; try not to have personal paperwork lying around. If possible, try to tone down the number of photographs; many a viewing has been in vain as buyers are distracted to see who they know instead of looking at the rooms. Pay attention to the clutter in the kitchen This is one of the more important rooms in the house, so make sure buyers can see clear work surfaces and utilities. Wipe away grubby marks. Buyers may see dirty marks on walls or surfaces as a sign that the house is not well maintained - keep the house as mark-free as possible. Consider a re-paint. The cost of a room redecoration may be reasonable to get the best asking prices possible. When showing your house to buyers, lighting is key! Try to have the house fully lit before the viewing starts so buyers don't experience any bleakness to the property. Keep the house fully lit until after they have gone. If you are showing your house yourself, let the viewers walk in the room first and let them look at the room without you or anyone else in it - a crowded room may not be so appealing. Make sure all light bulbs are working so that the rooms can be fully lit. Gardens are a delight – keep lawns mowed and hedges trimmed. If your house is close to a noisy road or school, consider soundproofing or reinforcing the glazing of the house.Or simply make sure your windows are closed before the viewing starts. Does the house produce any sounds that may be concerning.You may have noisy pipe-works, creaking floorboards and doors. A well-oiled hinge can go a long way. An essential quality that is often overlooked is the smell of the property.Potential buyers can be instantly put off when foul odours hang in the air. Try to have naturally pleasant smells in the house. Don't overdo it with air fresheners in every room. Perhaps have a pot of coffee brewing in the kitchen when the house is being viewed. For the more culinary types, maybe have a fresh loaf of bread baking in the oven: it is clichéd, but it does work! Sinks, drains and toilets – all sources of rotten smells. Make sure these are unblocked, clean and flushed! Clean out the refridgerator as this can be the cause of bad odours. Do not leave laundry hanging around the house on viewing days. Before viewing your home, dispose of all litter bags and waste products properly. Pets - we all love them, but they aren't the greatest to have around when selling the house. If you have dogs or cats, make sure their presence is pleasing on the nose. Get rid of litter trays or other waste. Their food may also give off strong odours, so consider feeding pets after buyers have viewed the house. Make sure that those parts of the house that will be touched are clean and free of debris. Work surfaces, door handles, banisters, light switches, door bells - these can all be held under scrutiny by potential buyers. So make sure they are smooth, tactile and grime-free. They may judge what they don't see by what they touch. Maybe the one sense that is not so relevant to a house-seller. But if you are the hospitable type and offer any viewers any treats or drinks, polish off the finest china and get their tastebuds going by making your property as appetising as possible. Alan Cooke Estate Agents is happy to offer some promotional deals for Landlords looking to rent out their properties. For a limited time, we are able to cut our charges so that experienced or first-time Landlords can see what the Alan Cooke mark of excellence provides. Alan Cooke Estate Agents have provided property sales and rental services to the Leeds housing market for many years. "We believe in giving a strong customer-focussed service to all residential property owners, whether selling or renting out their homes." said Alan, an Estate Agent who began collecting rental payments in the 50's. "At the moment, everyone is worried about the state of the economy and the lending habits of banks. Whatever the condition of the market, you can always be assured that we will look after you as a valued client and will make sure you can contact us, 7 days a week." If you are a landlord with a property to rent, please call our office on 0113 2888 666. We are certain that we can provide a deal that will suit your specific requirements. As one of North Leeds' most established Estate Agents, we are for ever proud of our history since Alan began collecting rents in 1958. Our image has always been constant from its inception as Town Estates up to now. We are now proud to present a small yet subtle change to the way that we look... hopefully bringing our 50 year service well beyond 2013. We will be using our new logo for both our Residential Sales and our newly revamped Rentals Service, where you can be sure that our experience, commitment to our clients and our friendly service will continue to flourish. A new year has commenced and how does it feel? Activity in the property market picked up in the final month of last year and we believe that this year will see some further improvement. New properties are coming on to the market and the number viewings are definitely up. This will lead to more offers and then sales. The Halifax and the Royal Institute of Chartered Surveyors have both reported that they expect stable house prices and a steady market in 2013. The major builders always provide a good guide and on Monday 14 January 2013 Taylor Wimpey announced better than expected results. This follows an upbeat report from Bellway. So all we can say is that now is the time to market your property. Price it right and you will get action. The internet is now the recognised way of property shopping and Zoopla has emerged as a major competitor to Rightmove to catch the eye of prospective purchasers. Here at Alan Cooke Estate Agents we advertise all our properties on both sites as well as many others including primelocation.com and findaproperty.com. Traditionally the market starts to quieten this time of the year in readiness for December's festivities. This year enquiries are still strong and offers to purchase are still coming in. We expect that activity will be similar to previous years when sales were steady right up to Christmas Eve. The internet has changed the world of Estate Agency. Allowing one man bands to work from their bedrooms and present to the world that they are a major organisation. The supermarkets who have killed off the local grocer, baker, butcher and fishmonger have also had their foray into selling houses. To date all the supermarkets attempts have failed costing them millions of pounds. It is a fact that the internet is a fantastic tool for the agent - getting his properties in front of an unbelievable vast audience in seconds. However this is only one face of a good agents wares. An office that is open to the public - seven days a week is imperative, a good window display, experienced helpful and honest staff, a seven day a week viewing service - and most important a good solid reputation backed up by membership of the leading estate agents association. At Alan Cooke we are members of the National Association Of Estate Agents, The Association Of Residential Letting Agents, The Move With Us Partner Property Organisation and are members of the Property Ombudsmen. Alan Cooke started in the business as a 16 year old to learn the business from scratch. After over 50 years of selling houses our foundation and reputation has been set in stone. The biggest change in estate agency has seen advertising in newspapers practically taken over by internet advertising. 24 hours a day, seven days a week prospective purchasers can view details of properties, floor plans and virtual tours from the comfort of their own homes. They can research their market in a quicker more efficient way than ever. We at Alan Cooke Estate Agents have always had our website at www.alancooke.co.uk and this is always up to date. New properties are immediately displayed as soon as they come to the market. Price changes are immediately activated and new sales are immediately shown. We have also always displayed all of our properties on many of the leading property websites and have now increased our coverage, so that all of our properties will get the largest exposure. House sales in North Leeds on the up! Sales have definitely picked up over the last four months. We believe that one of the many reasons for this together with having a correct, realistic asking price is that there are fewer properties on the market. Therefore purchasers have a smaller choice. In many ways this is a good time to market, as your property will not have to compete with lots of other similar properties.